Pilot. Outdoorswoman. Adventurer. Animal lover. 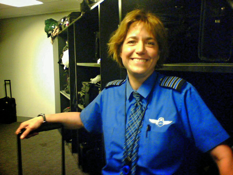 I've been an airline pilot since 1994 and a captain at JetBlue since 2007. I enjoy traveling. I have been to the Galapagos Islands and hiked to Machu Picchu, through the Grand Canyon, and from Mount Blanc to the Matterhorn. I enjoy fixing what's broken. But the best thing is being an aunt!